Working with Ralph Emerson of Oceanside Photo and Telescope, Trey Mcgriff and I drove down to Eastlake High School in Chula Vista Ca. 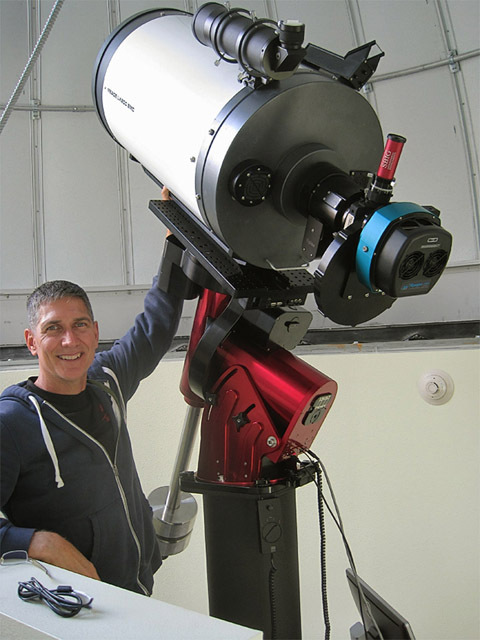 There we met with Paul Gardner, and some of the staff, installed the the 16 inch LX200 telescope and Paramount MEII on their pier and tested it's operation. After Nightfall. 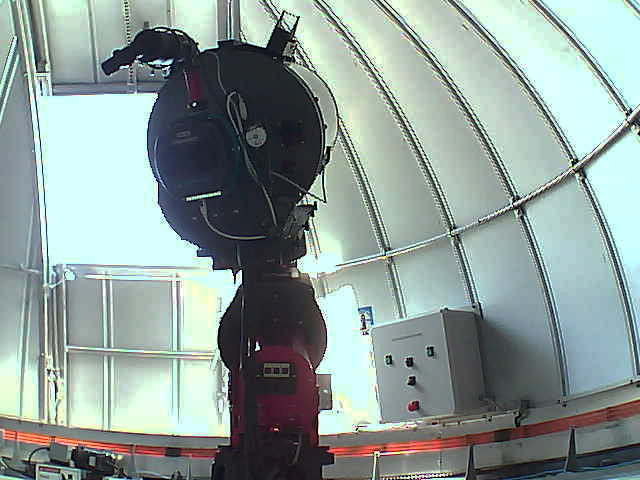 the mount was "Polar" aligned and collimated. 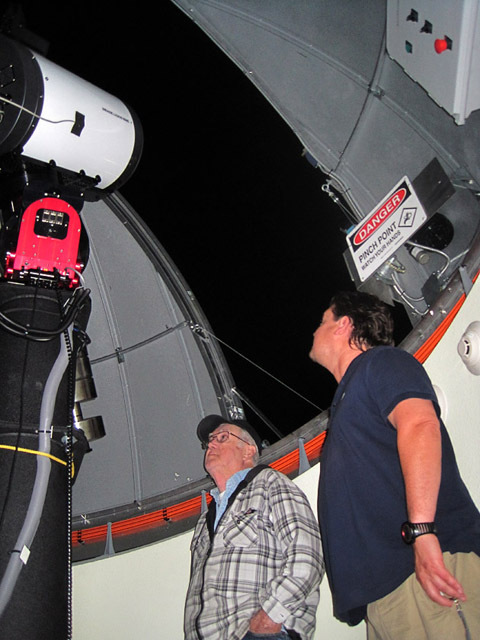 Telescope control software was installed on the computer and the Apogee camera was tested. 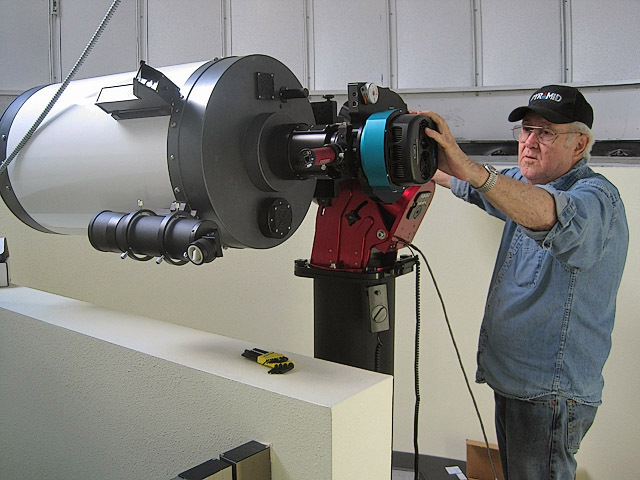 Notice that if the telescope were to be pointed straight up, the camera assembly would hit the elevator's wall. This required us to install an 18 inch extension to the pier. 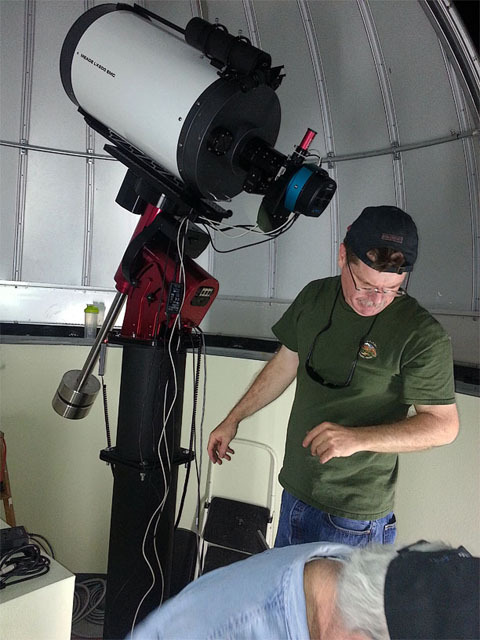 After installation of the extension, the mount's polar alignment was re-checked. Next image. 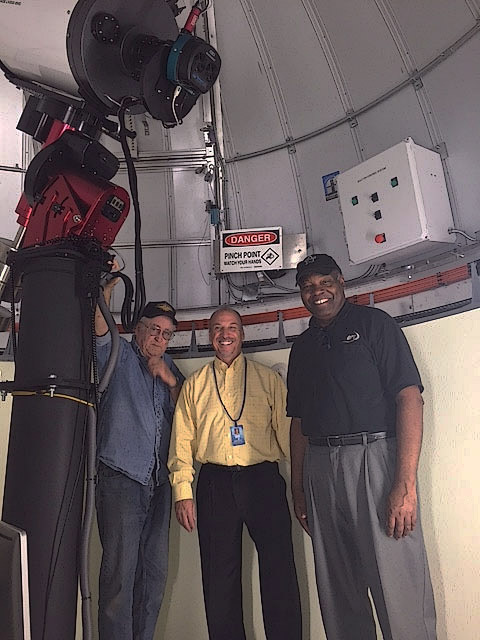 Myself, Larry Moen and Ralph Emerson next to completed Telescope installation. Paul Gardner's Wiring Harness complete. All accessories connected to the computer including Dome Control. The Counter weight extension shaft has been removed and two additional counter weights added to achive balance. 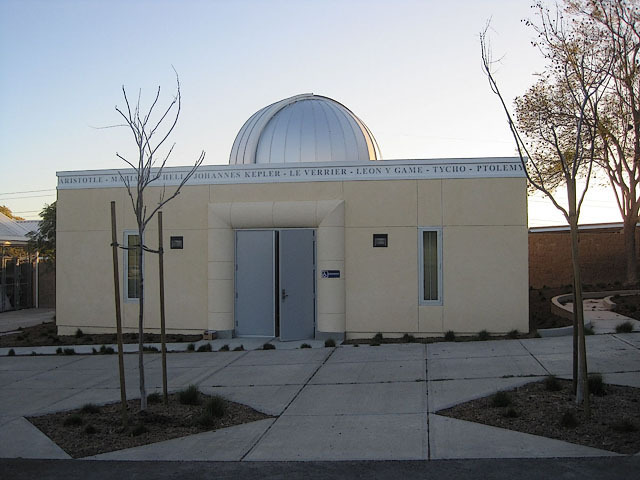 Dome Shutter control box can be seen mounted to the dome. 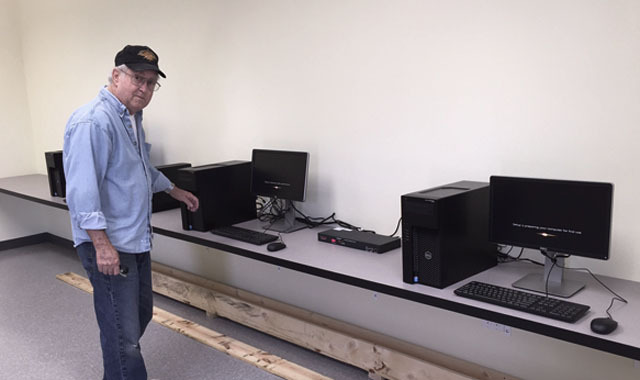 Ready for first imaging session. This was a bust. Mother nature decided that it was time for a heavy marine layer so we were clouded out. 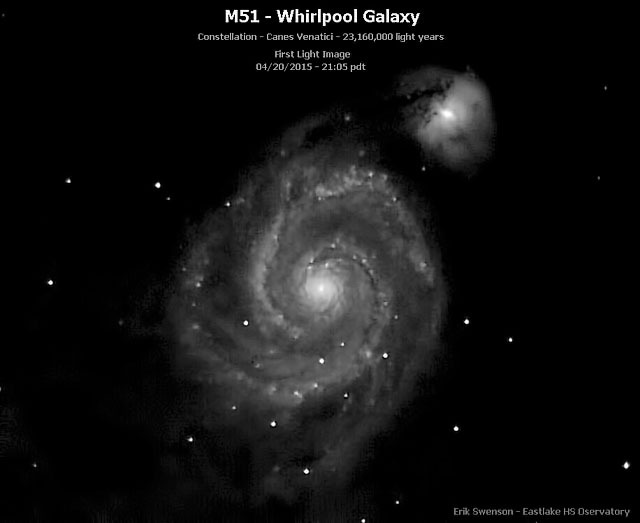 Erik Swenson, the Astronomy instructor, was there and we had the telescope pointed at M51. Now we just wait on the weather for the first image. This was a team effort with Erik at the control consol. The sky conditions were not good with haze and scattered clouds. Image was 6x5 minutes bin 2x2, clear filter.